Saturday is normally a contemporary low-fi affair in the shop. Think Dum Dum Girls followed by a touch of something heavier, i.e Von Bondies. I like to dial things back a bit in the afternoon, a la Cream or The Sonics but for the most part, it’s a fairly easy choice to make. Predictable even. That may explain in part why a few of my regular miscreants (because ‘friend’ is such a strong word after Friday night) raised at least one of their collective eyebrows at this particular foray into the boxes this weekend. 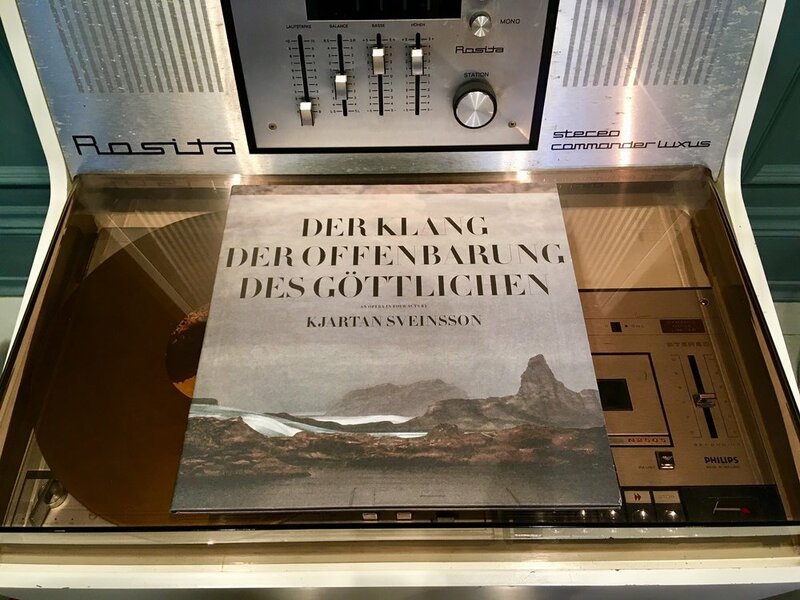 ‘Der Klang Der Offenbarung Des Gottlichen’ is ostensibly (read literally) an opera in four acts, from the minds of former Sigur Rosser, Kjartan Sveinnsson and artist Ragnar Kjartansson. It is, according to the record sleeve, an opera without divas. I think they might be somewhere on the money there. Another Vinyl Factory / Bel Air Glamour Records job - see also the fox-possessed pressing of ‘The Visitors’ by Kjartansson and The All Star Band with its inspired sleeve notes - it’s a pretty damned fine piece of vinyl. Inspired by ‘World Light’(1937-1940), courtesy of Icelandic Nobel laureate Halldor Laxness it’s about as close as we’re getting to the audio embodiment of an incurable longing for beauty and the attached catastrophic consequences. Read into that what you will, it’s intense. I’ll leave it there and beg you bring your ears. It’s a fine game to at least attempt reading everything that comes through the door before it goes back out the same way. Regrettably, it’s not always a feat I manage. That being said, I have absolutely gone cover to board on the Guy Bourdin ‘Kodak’ that found it’s way here last week. Untouched and unfound for what we might as well commonly term as ‘time’, his first contacts of street photography get cropped and pop with an intensity that belies the portrait come fashion photographer who would later dominate the pages of French Vogue alongside Helmut Newton in the 1970s. I’m glad, I’m glad, I’m glad I got to devour the lot, essays and all. That thing’s going any day now. It’s also that very Kodak yellow which is one of the better things in life. Nico & Tom and I are headed into the studio sometime over the next couple of months. It sounds..loud. And getting tighter. In the meantime, if anyone would like to know how to get a brutal-sized Pierre Chapo transforming dining table down a quirky flight of stairs without assistance, I’m your man.